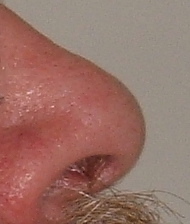 nose is part of the Basic English 850. The part of the face that sticks out and is used for breathing and smelling things. His nose is very big. If you nose, you move with caution. If you nose you snoop. She was nosing around other people’s business. If you nose something, you push it with your nose. This page was last edited on 24 April 2017, at 00:47.